Last weekend the bridgemen traveled to Wildwood, NJ for the Elks State Convention. The highlight of the weekend is the parade for which the individual lodges prepare for all year. The Bridgemen performing for the Lake Hopatkong Elks lodge, captured the best overall music award propelling the lodge to second place overall in the fight for the Governors trophy. 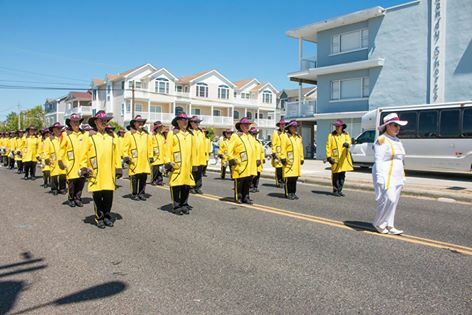 The corps will be returning to Bayonne to perform at the 9th annual Tournament of stars Saturday June 21st, 6pm at Veterans Stadium. A total of 8 groups from across the Northeast will. Perform with 4 of them in competition and 4 in exhibition. Tickets are $15 for adults. There will be concessions and souvenirs available. Come out and support the Bridgemen and enjoy the pageantry, fun and excitement as competitive drum corps return to Bayonne. Visit www.bridgemen.comfor more information. Posted by DCP Publisher on Saturday, June 14th, 2014. Filed under Current News, DCA News, FrontPage Feature.